In 1970 Edwin Starr recorded a song written by Norman Whitfield and Barrett Strong that was produced on the Motown label. It was a protest song written about the Vietnam War and was a huge hit worldwide. Despite being released 45 years ago, when it is played it still seems to resonate, partly I guess because war is something that persists and its value is still questionable. In recent weeks we have seen the outrage that terror brings from the Beirut attacks, the downing of the Russian airliner in the Sinai, to the Paris killings. A not surprising response to that has been the declaration of War against the perpetrators. Whether this is necessarily a bad thing is much more in the realms of a military strategist (which I’m not) to determine. It suggests an enemy with less moral authority than us (although they are saying the exact same thing on the other side). So, straight away, the word ‘war’ starts to seem inadequate at best or inappropriate at worst in most situations. Take drugs for example. I’ve been watching the excellent Netflix series Narcos and it is clear that the whole drug trade is a complex web of competing or coinciding interests and not as straight-forward as say fighting the Hun. Outside of the horror of a conventional battle between two nations (the true definition of war) everything gets a lot more fuzzy. The war on cancer is surely an oxymoron. To kill is the mechanism by which wars are won. The war on cancer is presumably to save lives. Same applies to want or poverty…indeed quite a lot of the want is a by-product of the various wars being raged from time to time be it in Africa or in the Middle-east at present. The greatest ‘distortion’ of the word ‘war’ has to be the much used term now for getting and retaining your valuable staff. As if the words ‘attracting and retaining our valuable staff members’ is not emphatic enough, the phrase ‘the war for talent’ is being used in its place. It’s faddy, it’s inaccurate and it’s just plain wrong. As Lucy Kellaway in her recent column in the FT and AFR pointed out – where is the enemy? When I went to business school it was very trendy (and may still be) to quote Sun Tzu (The Art of War) as a short-cut solution to managerial problems. To confront and solve your managerial challenges armed with a copy of said tome is not that helpful. Let me quote. ‘The best leadership destroys the enemy’s plan.’ Not sure Harvard Business Review would concur and they bang on about leadership a lot. ‘Next best is to destroy their alliances.’ Once again not so sure. Maybe better to look at being smarter, leaner and more responsive. ‘After that comes the destruction of his army in the field.’ Hmmmmm. ‘Worst of all is to attack fortified cities.’ I’m with you there big fellah! On first read that sounds like military strategy and not of great help to a manager, say, grappling with the reputational damage of a failed tailings dam in Brazil (a la BHP Billiton and Vale). It’s time we put the war books and war references down and looked to other avenues, softer ones perhaps, that might speak to how we can get really good people to join us and then stay with us – once known euphemistically as the loyalty effect. Of course being the ‘naysayer’ and the ‘anti-guy’ can always be seen as easy. My critics might pose a tougher question and demand that I come up with some suggestions of my own. So here goes. Let me play devil’s advocate and address some ‘War for Talent’ issues. from The Art of War: ‘Train the people (talent). Discipline them (the talent). They (the talent) will submit.’ …awkward! To offer the potential to truly grow and truly create has to be much more alluring than some borrowed and distorted tactics translated across from the theatres of war. Recent events have taught me one thing. We need to be kinder, gentler and more forgiving to ourselves, our team members and our community because there is enough of the other stuff happening out there to go around without adding to the mix. Let’s end poverty and want, let’s cure cancer, let’s solve the drug scourge and let’s all get talented individuals to join our teams because we will support them, nourish them and sometimes even let them go to grow. The last thing anyone in their right mind would want to do is place them anywhere near a ‘war zone’ in whatever shape or form. I’ve watched pretty much wall-to-wall rugby over the last nine weeks crowning that ‘achievement’ with the World Cup Final – a spectacle featuring the top two rugby nations in the World namely New Zealand and Australia. No real game can be watched without the obligatory pre-match build up. Here, so called ‘experts’, become hostages to fortune with outrageous claims of what is likely to happen and why. There is a universal phenomenon that occurs at this time. Despite being selected for their expertise, presumably based on their substantial knowledge of the game and their objective assessments, they throw all sense out the window opting for comments based, not on the years of expertise honed from playing and observing the game, but rather from some form of softish xenophobia. Rugby is a brutish game; arguably the most ruggedly physical sport of them all. But is also, too, a game of great tactics where the muscle between the cauliflowered ears is often more useful than the size of one’s quads. When the pre-match experts make their comments, it is the former rather than the latter that they are opining. The age-old desire to out-muscle the opponent surely harks back to some Darwinian instinct that tells us if we can be the strongest we will attract the best mating partner. It’s old playground stuff. I’m bigger than you and if clearly I’m not then my Dad is bigger than your Dad. What we know from the World Cup Final is that brains will almost always prevail over brawn. The ‘back three’ loose forwards of Australia were acknowledged by the press almost universally (except probably in New Zealand) as being the dominant force in the world game. ‘Foocock’ as the collective noun became (an abbreviated version of Pocock*, Hooper and Fardy) were seen as just having more muscle than the rest. The constant close-ups of Pocock’s twin-barrelled black eyes and references to this warrior dogged determination were testament to the fact that, yes, our Aussie (Australian) genes are …well frankly… better than yours. As it turned out New Zealand, a nation allegedly full of rugged men and nervous sheep, simply out-thunk us. They played a game that nullified the potency of the brawn. Clever! The other aspect of the pre-match build up that interested me was much more specific. There was a discussion about the power of the Haka (the New Zealand ‘war dance’ done traditionally before kick-off which is a cultural under-pinning of New Zealand indigenous Maori population). Much has been written in the UK press about the special treatment afforded the All Blacks (NZ) in allowing them to perform the Haka and that it gives them an unfair advantage. On paper this would seem like a petty thing but to stand in front of the haka with a group of hardened warriors challenging you to ‘war’ is as intimidating a spectre as you will find in world sport. Added to this, it both fires up those doing the Haka and dilutes any excess of adrenalin which at the beginning of a match streams through the veins and can cause early handling errors. So maybe then it is a bit unfair. Perhaps the better question the UK press should have posed is what special indigenous ‘ceremony’ each nation should be allowed to do to make it an equal playing field? In fact the All Blacks are not the only nation to perform such a ceremony. Other Pacific Islands have their own variation of a haka and these are performed without any rancour from the press (most probably because these minnow nations don’t pose a threat to the established order of rugby). 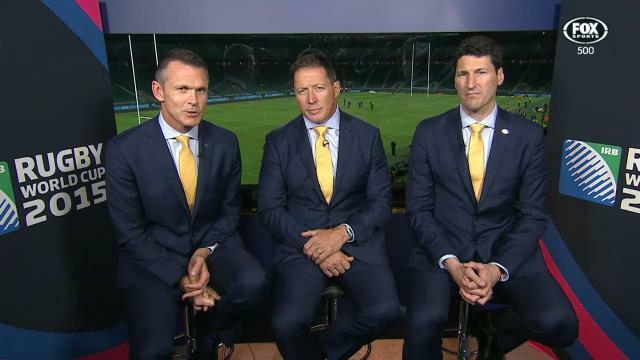 To their credit the pre-match panellists from Australia stood firm in support of the Haka for their trans-Tasman rivals. They even lamented the fact that they had no such equivalent. Australia has an indigenous population, many of whom have graced Wallaby (Australian) teams over the years including the current one. Our First Australians have dance and war dance every bit, one would have thought, as intimidating as the Haka. The fact is NZ uses the Haka because it speaks to NZ culture. This is where NZ differs from many other nations. The Haka, derived from Maori culture is now intrinsically part of NZ culture and not sectioned off for the indigenous only to be wheeled out for the wider world for visiting dignitaries etc. Everyone knows a haka, including the nation’s most common one used prior to rugby games. It is not only a war cry. The Haka is an expression of a nation’s pride, happiness, or sadness. It speaks to the mana (soul) of its iwi (people). New Zealanders know this, accept it and embrace it. Other nations could learn from this. Rugby runs through the veins of New Zealanders whereas in other nations (with the exception of Pacific Island nations and Wales) it runs through the blue-blood. Perhaps therein lies the strength of NZ rugby. They truly take their nation with them. There is a spiritual, or soul aspect that is missing from the way many other nations play the game. So in giving away NZ’s secret ingredient to prolonged rugby success, we must ponder how other nations can level the playing field. Can I suggest England needs a Morris dance before the kick-off. Scotland can do some Highland reels and Ireland some twinkle-toed Irish dancing à la Michael Flatley. As for other nations, the Welsh included, the onus is on them to discover or re-discover the absolute joy of dance and bring this to bear to intimidate and stir in equal measure. And so to how we can apply these learnings to the world of business? Well let me just say that many hours without sleep doesn’t make for the best judgement when making decisions. Perhaps when challenged at work by a colleague, or competitor, the Haka – while tempting – is not the best response when under pressure! *The irony here is that David Pocock is indeed a thinking man, despite the size of his ‘guns’. His support of issues relating to Australian refugee policy, his stance on homophobia in rugby and his thesis about the structural violence of capitalism set him above the ‘scrum’ as it were.